Drums may vary in design per manufacturer than those shown above. 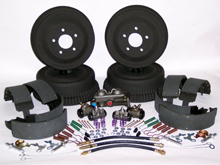 MCB All New Stage-III technologically advanced high performance brake system for the pre 1972 Muscle Cars & Classic Trucks: Thermo Cooled Drums are coupled with MCB Matrix Ceramic Brake Shoes, Master Cylinder, High Volume Wheel Cylinders, Heavy Trick Spring Kit, Star Wheel Self Adjuster Combo Kit and front & rear Brake Hoses. MCB Stage-III will give that Muscle Car or Classic Truck as much as 38% better braking than over the counter brakes. Self Adjusters may not be available on some older models.